Odyssey was bound to bring changes. However, in my relative inexperience and ignorance I didn't expect the market to do all the terrible things that it did. I expected some of it. I flirted with speculation and stockpiled on various things. I understood that some prices would change but I didn't expect to stare at the window of 30+ million is CovOps frigates. If demand increases and supply remains unchanged, a shortage occurs, leading to a higher equilibrium price. If demand decreases and supply remains unchanged, a surplus occurs, leading to a lower equilibrium price. If demand remains unchanged and supply increases, a surplus occurs, leading to a lower equilibrium price. If demand remains unchanged and supply decreases, a shortage occurs, leading to a higher equilibrium price. Eve lives under these laws. Players make the items and place them on the market. Items are only worth what people will pay for them. People will pay for what they need. Odyssey meant that everyone wanted CovOps frigates and they sucked the market dry. 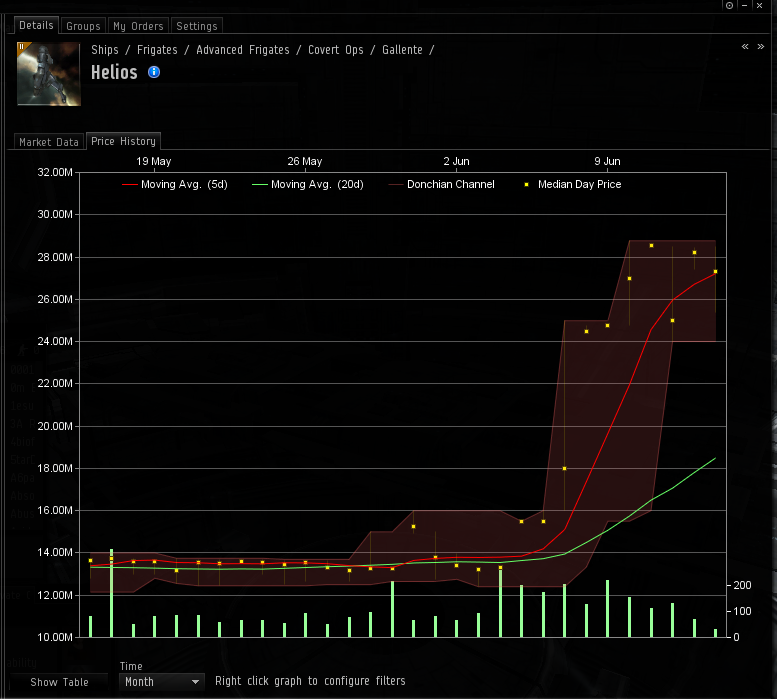 The market rebounded by increasing the price and suddenly I am stuck with 30+ million ISK CovOps frigates in my market. I could wail and gnash my teeth and say that I should have stocked up. 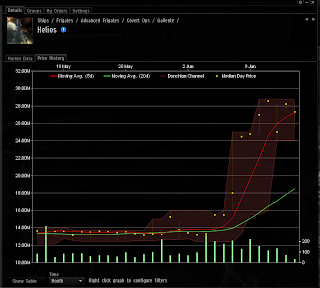 In reality, I don't have the ISK to stock up in that manner. It is not an option and never has been. Nothing is wrong with that. None of that stops me from feeling strange at major price jumps. 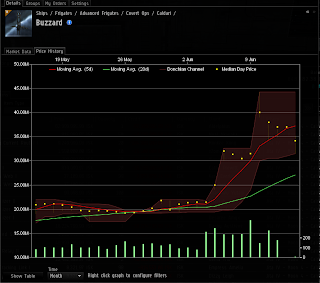 Plus, the entire mineral rebalance and change to T2 production creation has skewed the prices all over the place. A lot of my discomfort comes from the fact that I pass along price fluxuations to my buyers. I don't buy huge stacks of items most of the time. If I buy thirty of a module at one price and the next time I buy it to refill the price has decreased or increased, I directly pass that on. 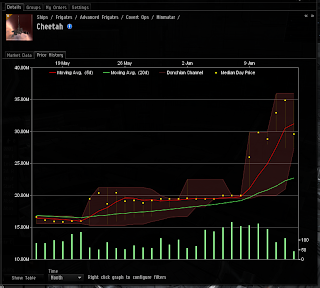 Most of the time it is only going to be seen as a few thousand ISK here and there. These types of changes are enormious. Buzzards were the first to go up. Then Cheetahs. I found myself going , EEP! over these changes. I did buy a few Buzzards on autopilot one day and that is how I noticed I paid 36 million for them. I took a deep breath, listed them, and they sold. 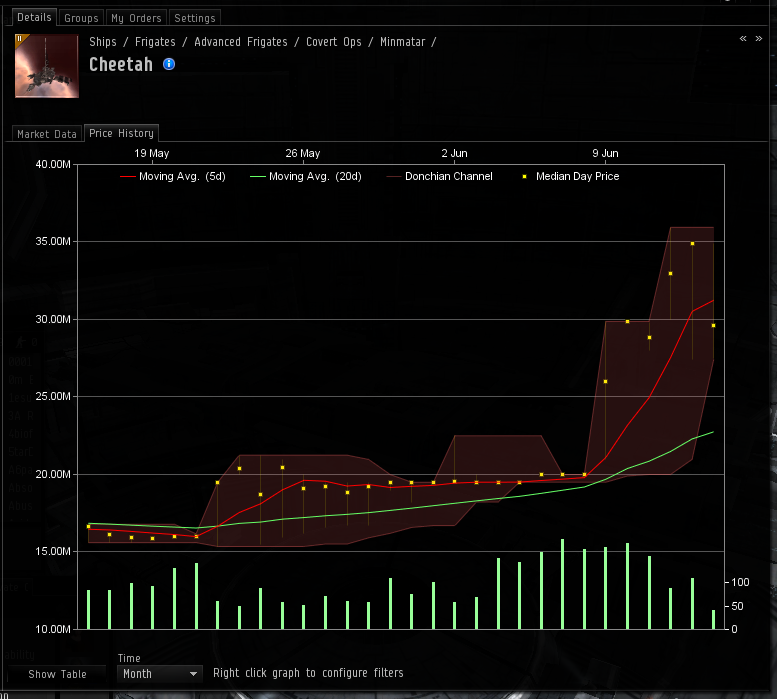 But now, I saw the price increase everywhere. I decided ti shy away from restocking CovOps frigates for a few days. The market sometimes bucks and heaves and then it starts to settle back down. 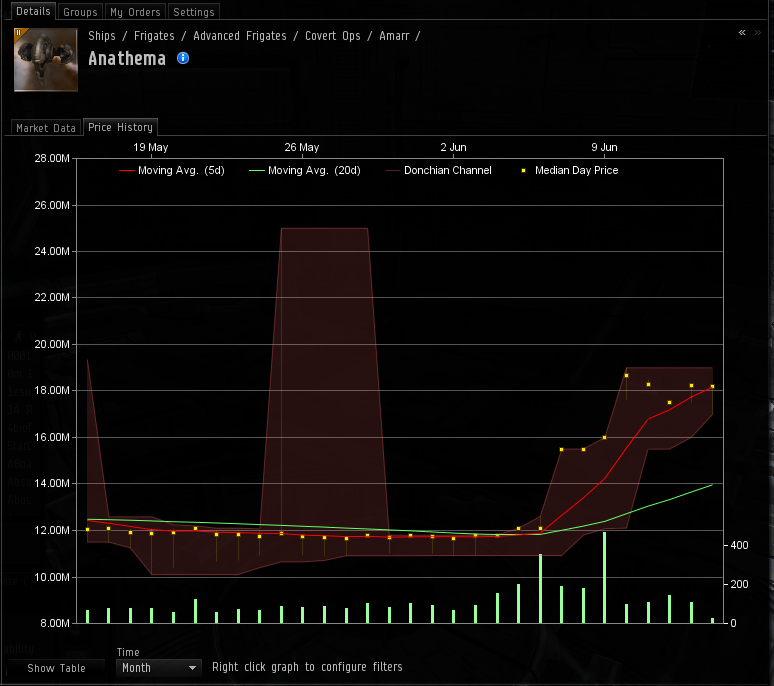 However, I saw my own beloved Anathema start to creep up in price. The most unloved of all CovOps that it is. 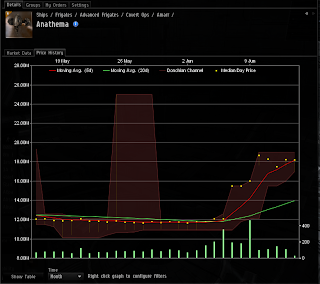 The interesting thing is that when I first started buying Anathema's last May they cost me 17 million ISK. At some point they plummeted down in price. That was just around the time that I stopped losing Anathemas. Sigh. But now the prices were up across the board. The demand for CovOps frigates was still strong. I found myself selling cloaks, launchers, probes, analyzers left and right. I was uncomfortable with the price increase but it was not as if I was increasing them for my own amusement and it was not as if people do not want them. "Speculation is the practice of engaging in risky financial transactions in an attempt to profit from short or medium term fluctuations in the market value of a tradable good such as a financial instrument, rather than attempting to profit from the underlying financial attributes embodied in the instrument such as capital gains, interest, or dividends. Many speculators pay little attention to the fundamental value of a security and instead focus purely on price movements." With TCS (and in general) this is not me. I am still a part of this world and must deal with the side effect of it. It is new to me even if it is old to others. But it is an area I wish to be cautious about. The market is full of pitfalls. 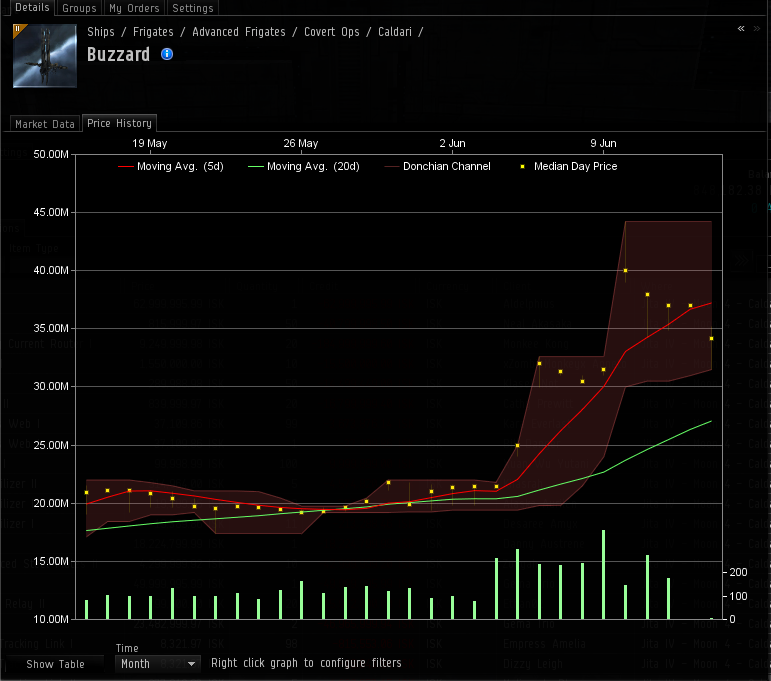 Just as people randomly manipulate items, prices rise and fall and people get trapped on the wrong end of the graph. I'm trying (perhaps in vain) to avoid that. Cov Ops with more midslots are better for the new exploration sites. Hence why the buzzard is popular. Which is a good example of my inexperience and ignorance. @Naoru Kozan - Then why would someone not pick a Helios over a Buzzard, as the Helios also has 5 mid slots and 1 extra low slot over the Buzzard. the helios only has +5 to viruis strength while the cov ops have +10. Due to the nature of the minigame mechanics, +5 really doesn't do you any good while +10 will push up you to 40 with a t2 analyzer and thus be able to take much less damage. @Anom: No, the Helios has +10 virus strength just like all other CovOps frigates do. With the removal of salvaging cans from exploration sites the Helios is now the best explo CovOps, but as Sugar has said, more people fly Caldari so Buzzards are more popular despite not being quite as good.